The Web Team Go forth and search! The search function on the website has never been anything to shout about. It was slow, it frequently returned broken links, it took ages to populate with new content. Personally I was shocked anyone ever used it to try to find anything as it was so unreliable, but then as Senior Content Designer I do tend to know where everything is on the website without searching, so, a bit of an unfair advantage. But fret no more! We have a new website search! It is simply Google’s custom search engine, but the key is in that first word – custom. Anna set up and styled the search, and then let me loose on it. 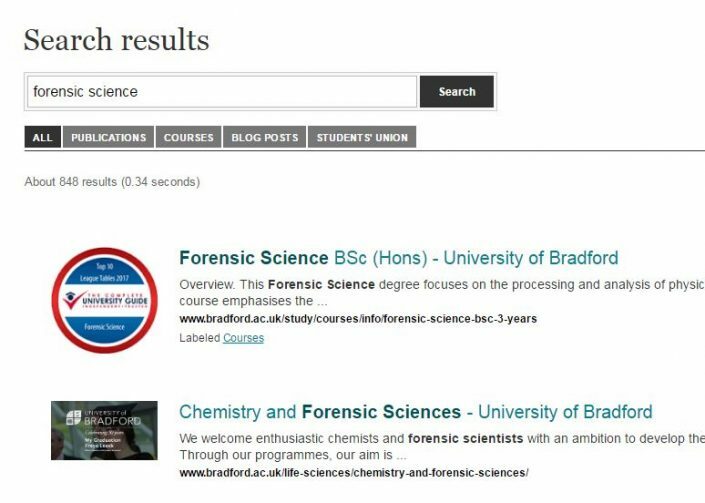 I was delighted when I realised we could categorise search results, and for now I’ve chosen to highlight Courses (returning only pages from our course database), Publications (searching Bradford Scholars), Students’ Union (searching their completely separate website) and Blog posts (no further explanation necessary, I hope). It’s also very quick and easy to return promoted results, which is particularly useful for the external systems we use such as ServiceNow, Blackboard and Summons.